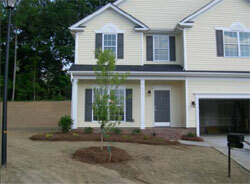 Landscaping is a truly exciting thing to watch happen to your new home. A final grading with heavy machinery takes place on your lot and the ground is lightly tilled so that grass seed can be sown. Since natural vegetation, trees, bushes and even mulch material can vary greatly from area to area, your home may have a totally different look and feel from the deciduous plants and pine straw mulch of our home. Grass is considered one of the most robust plants to ever exist. It is said that grass is able to survive fires as they grow from underneath the soil instead of from a tree. In fact, in select areas such as the Savannah, fire even has the capacity to stimulate the growth of certain kinds of grasses. The species of this plant comes in different forms. Grass is also a customary member of the plant life as it can grow on any type of surface except for ice or glass. It is therefore highly important to take into consideration planting grass on your home landscape. Not only will it make your front or back lawn look welcoming to outsiders, it will also provide ecological continuity that strengthens nature's food chain. First, you must determine where you want the grass to grow. Planting the seeds are so specific that even a tiny spot that is not seeded will become as bare as earth in the next few days. Survey your bare lawn and imagine how it would look like if greenery were present. Consider some parts where you do not want the grass to grow. This, of course, is applicable to those who also plan to do a bit of landscaping. If there is a specific part on your lawn wherein you plan to create a mulched area, then begin to segregate the lot by using sticks and strings as barriers. Once you have done so, then you are now free to begin seed planting. Another thing you need to take note of is the season when you are going to plant the seeds. Some types of grass such as the fine fescue, Kentucky bluegrass and perennial rye demand a certain time in order for them to grow successfully. The ideal time to plant cool season grasses, for instance, is August and September, when temperatures have dropped significantly, allowing the earth to be cool enough for any type of plant. The best thing about planting during these months is that you have enough time before winter to wait for the grass to grow. For spring grasses, on the other hand, planting should take place during April and May. If the snow has already melted earlier than usual in your area, then you can begin as early as March. These months are ideal for planting spring grasses so you will not become bothered when the heat of summer arrives. Growing grass is a huge responsibility to you as a gardener. You must have the perseverance to maintain the plants so no problems will occur. Remember that if the seed grass sprouts dry out due to lack of water, there is not much you can do to stop its imminent dehydration. Provide the lawn with adequate water as the pre-sprout stage is considered the most critical phase of grass growing. You should then cover the grass seed with straw. The straw will protect the seeds. When watering grass, you should make sure to keep the straw moist at all times. Once you begin to see sprouts of grass through the straw, you can carefully rake the straw away from the grass. Water your lawn for about five to thirty days at most and you will begin to see the results. It is therefore wise to assess your determination and persistence before you decide to plant your lawn with grass seeds. Remember that patience is not the only key to growing your grass on your front or back lawn. Your planting experience will not be complete without your trusted tools. The most ideal ones to have in your possession are a rake, a lawn roller, straw for covering, an irrigation system and, of course, a hose. You can buy these tools from your local gardening store or hardware store. These are all important materials needed for you to grow your grass easily and without any unnecessary problems.